Welcome to the world of Marine Conservation Cambodia. As you have probably already read we are a small grass roots conservation group based in Kep Province, Cambodia. We are situated on our own private island, Koh Seh is roughly 18km from the mainland town of Kep. Kep Mainland itself is an area rich with history dating back to when Cambodia first developed as a country. With beautiful national parks and a diverse culture. Almost on the border of Vietnam, our tropical paradise island of Koh Seh offers a sanctuary that can’t be matched. With sweeping views of our neighboring 6 islands, there is no place on Koh Seh the view is simply not spectacular. Our beautiful bay offers calm seas almost all year round, whilst the rest of the island is covered in dense Jungle. Koh Seh is an outcrop island, meaning it is essentially a small mountain that slopes to the warm tropical waters. The warm winds make it an ideal place to watch a sunrise, or climb over the hill for a breathtaking sunset. Diving into our protected waters you can witness first hand the stunning diversity that is slowly coming back to our area. After the last two years of protection we are seeing an explosion of previously absent species. Regular visits from the Dolphins and the occasional Turtle are always a bonus. And even though we have not seen them yet we are also on the main migratory route for Dugongs too!!. Our work on the conservation of our area is something that any long staying volunteer can see direct results from during their time on the island. Living on the island you will truly get to learn and love Cambodian culture. From eating local Khmer food to getting to know our local team members. It is a warm and welcoming culture, one which you will begin to love and will always remember. If you are tired of witnessing the destruction of the world’s oceans, but don't know how you can make a difference? Thinking about volunteering, but don’t know which organization to trust? Want to take direct, hands on, action that will have an immediate result? You have found us, that is what we do daily and we need your help and support. At MCC we are always looking for those dedicated volunteers and interns who truly want to make a difference. If you are looking for a beachside vacation with the odd dive here or there, MCC probably isn’t the place for you. We do NOT offer voluntourism, we do not try to sell you something we think you want, we integrate you into our team and continue the work we have been entrusted to carry out involving you and utilising your skills and passion, our goal is conservation and the regeneration of a once beautiful area that is in the beginnings of recovery. With 10 years of operational experience in Cambodia and a professional team of experienced, Marine biologists, Marine ecologists and environmental scientists Marine Conservation Cambodia welcomes both volunteers and international research assistants looking to gain practical conservation and research experience in the field, you can get involved our ongoing Marine research programs, community development projects and obtain on the ground skills in marine conservation and marine research along with your scuba diving qualifications, at the same time experience living life on a beautiful rural Cambodian island. We really do need your help and you can really make a difference using our established conservation network. Many of our past interns and volunteers have either continued on to successfully complete their education or moved directly on into full time marine research or conservation work using the practical experience they gained with us. The data collected from surveys is used to help assess the current status of our MFMA (Marine Fisheries Management Area), plan and develop new strategies and identify key habitats, as well as educating the communities on what is happening in their waters. You can download our current Kep marine assessments here. Not a certified SCUBA diver? Not a problem. We have a qualified dive instructor at MCC who would be more then happy to train and certify you. Want to become a dive master or simply upgrade your current dive level our staff can accommodate that as well. Having the ability to dive as often as you want makes getting those certification dives much easier not to mention much cheaper. So if you are a non-diver, our experienced PADI/SSI instructors can train you up to PADI or SSI Advanced open Water Level within the first two weeks of your stay, after which you will be ready for training in underwater marine survey techniques so you can start collecting data as a marine researcher. You will not only gain personal skills and experience, but the data you collect go’s directly toward the development and maintenance of Kep's First Marine Protected Area. Further diving training is available on request, and many of our interns move on to higher level dive leader courses. Extra, Buoyancy and Navigation training. Practical Marine Survey skills including, advanced reef (including Inverts, Substrate and Fish) , seagrass and benthic habitat monitoring, marine species abundance and distribution monitoring. 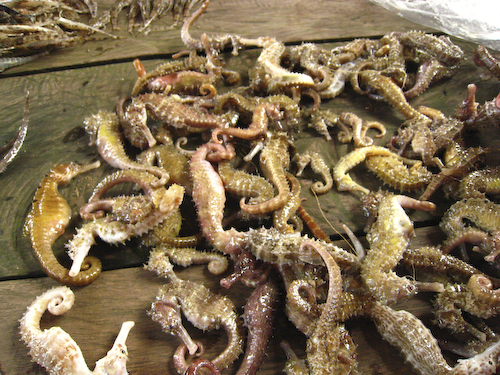 Experience in our specialty Seahorse research covering behavior, distribution and breeding. Diving isn’t the only type of marine conservation we do at MCC. Weekly we head into the local fishing communities to collect data from actual local fishermen. This data is collected in our socio demographic surveys and helps get the locals view on the current status of Cambodian waters. Beyond an interview it is also a great way to meet locals and experience their culture. Is data collection simply not enough for you? Do you want your efforts at MCC to have a direct, immediate result? We are one of the very few volunteer organizations who can accommodate these wishes. As a member of the MCC team you may have the opportunity to join us patrolling within the MFMA. This is completely optional of course, but for those who have an adventurous side, it’s the ultimate conservation rush. When the diving is done for the day the activities continue. From beach cleanups to recycling the garbage that washed up on our shores we try to practice as much conservation out of the water as we do in the water. We are currently developing a new type of composting technique as well as designing a battery powered by saltwater. All volunteers and interns are strongly encouraged to bring their conservation ideas to the island. As we are a small grassroots conservation organization we tend to be much more relaxed compared to the larger worldwide charities. If you don’t feel like doing an activity or simply need a break from diving you are welcome to it. Explore the island and discover the hidden secrets of Koh Seh. From the different types of fruit trees to the war bunkers left over from Cambodia’s turbulent past, there is always something to do while at MCC. The weekends are down time at MCC allowing the entire team to catch up on some much needed rest. You are welcome to stay on the island, filling your time however you want, or return to the mainland and explore the costal area of Cambodia. The Island on the weekend is extremely relaxing. From movie marathons to fun dives, it is your time, so do what you want. In town you can hike in the national parks or simply site poolside to work on your tan. Your activities are only limited by your imagination in Southern Cambodia. Volunteering or being an intern with Marine Conservation Cambodia is truly a life altering experience. 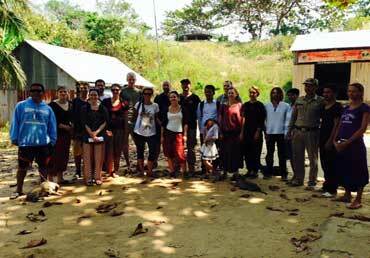 Many of our previous volunteers and interns have extended their trips or wished they had. Often we get volunteers and interns returning year after year. Many of the reasons they extend or return has to do with the conservation aspect of MCC, but another large part is the community like feel of life on the island. The friends you make at MCC will be friends for life! Want to get involved and join our team? Simply fill out the form, to get the process started. Have questions you want answered? Just send us an email and we will respond. Thank you for taking an interest in Marine Conservation Cambodia. We truly look forward to hearing from you.